Happy Spring! And, as the saying goes, April showers bring May flowers. Well, this month, Snow Quartz and Purple Agate are working to energetically bring more into your life not only for May but in the months. With the coming of spring, it is time for the energy to shift from one of quiet introspection and contemplation as best suited for the winter months and more into more thoughtful, mindful action. Every day is a fresh start. Keep that thought in mind as you begin each day anew and move through it with awareness. Snow Quartz is supporting you in seeing things around you with a fresh perspective and asking you to look at each situation, each moment, and each thought with almost a hyper sensitivity to detail. It is as if things are being uncovered after having been blanketed in snow for months – it’s time to see what the melted snow has left behind and decide what ideas, thoughts, and dreams ought to be planted and tended to now. In light of this heightened scrutiny, how does each piece you uncover fit into your life, as it is now and how you want it to be? 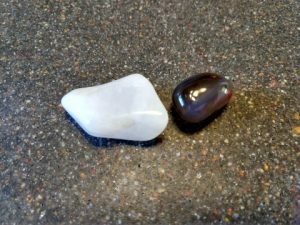 This is where Purple Agate can assist, helping you filter through all the incoming information and then assist in guiding you forward in alignment with your life’s goals and dreams. Connect with the crystal in prayer or meditation and follow the inspired guidance you receive afterward. This is the perfect time to start taking action and begin creating what you want for yourself in all areas and realms of your life, especially now that so much time has passed for reflection and contemplation. Trust that you are and will continually be guided where you need to go, but it will require being open and observant on your part to receive the information in timely fashion. How quickly you move toward your goals will be dependent on that. Happy creating!